Ehren Jordan is quite a vagabond. He is an East Coast transplant who majored in art history and classic archeology at George Washington University while working part time in a retail wine store. The experience convinced him to go West and he settled in Aspen, Colorado, where he skied and became a sommelier at a restaurant. He then set his sites on the North Coast region of California. When he arrived in Napa Valley, his first job at Joseph Phelps was a tour guide but he soon was hired to do cellar work and winemaking. He then moved to Europe to work in France’s Rhone Valley, returning stateside to take a winemaking job at Neyers in 1994 and then Turley in 1996. 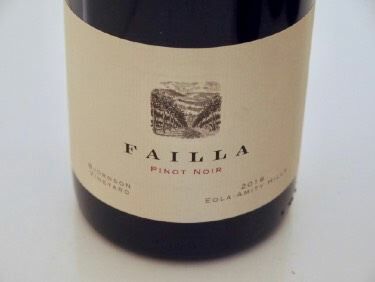 Under the Failla label, Ehren has crafted praiseworthy Pinot Noir, Chardonnay and Syrah almost exclusively from cool-climate sources in the North Coast including an Estate Vineyard located in the Fort Ross-Seaview AVA. Still on the move, Ehren’s quest for seeking out outstanding vineyards in unique places culminated with the establishment of a base in Oregon, and he began fashioning wines from both Oregon and California. Ehren initially made Pinot Noir from Oregon’s Seven Springs Vineyard at his California winery, but in 2016 began making Oregon wines in Oregon at the Carlton Winemakers Studio. In May 2018, Failla Wines moved its Oregon operations to Zenith Vineyard in the Eola-Amity Hills. The 83-acre Zenith Vineyard was first planted in 1989 by Pat and Patti O’Connor but was owned most recently by Tim and Kari Ramey. The vineyard has been the source of Pinot Noir and Chardonnay grapes for 20 winery clients, and in 2017, 16 wineries produced a Zenith Vineyard-designated wine. In December 2017, Zenith Vineyard acquired the winery and tasting room on the property that was established in 2008 by a partnership between Zenith Vineyard and St. Innocent Winery. St. Innocent’s Mark Vlossak had been the Zenith Vineyard winemaker since the first vintage in 2006. Ehren became the winemaker for Zenith Vineyard beginning in 2018 and Mark moved his St. Innocent Winery to another location in Salem. The vineyards that Failla Oregon works with are Bjornson, Chehalem Mountain, Eola Springs and Seven Springs. In 2016, Failla offered six Pinot Noirs from throughout the Willamette Valley and in 2017 the lineup was expanded to include Chardonnay, Riesling and Grüner Veltliner. Future plans call for developing an 80- acre vineyard site in Dallas, Oregon, located southwest of the new winery tasting room off Zena Road in Salem. Failla will continue to produce Pinot Noir and Chardonnay from California, double dipping as it were. The spring releases of 2017 vintage wines were just announced and include a Sonoma Coast Chardonnay, an Estate Fort Ross-Seaview Chardonnay, a Hudson Vineyard Chardonnay, a Haynes Vineyard Chardonnay, a Sonoma Coast Pinot Noir, a Keefer Ranch Pinot Noir, a Pearlessence Vineyard Pinot Noir and a Savoy Vineyard Pinot Noir. Failla Wines has a tasting room in St. Helena, CA open by appointment and a tasting room in Oregon open daily and by appointment. Several tasting options are offered at both locations. Visit www.faillawinesoregon.com and www.faillawines.com. The wines are sold primarily through a mailing list. A podcast featuring Ehren Jordan’s Oregon foothold is available at www.ildrinktothatpod.com, #456, recorded October 19, 2018. The 2016 vintage wines reviewed here struck me as more “California” in style than many Oregon Pinot Noirs in that the fruit was riper and the wines had significant extraction and structure.